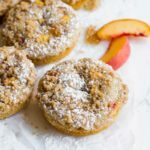 *This recipe was created for Simple Mills as part of a sponsored Instagram post, but the response was so overwhelmingly positive that I decided to post it here too! All opinions are my own. I don’t think we ever really need an excuse for donuts. They are just as welcome on a Monday in the office break room as they are on a lazy Saturday morning – in fact, maybe more so, since nothing brightens up the work day more than homemade baked goods. I speak from experience. A couple weeks ago, I brought the donuts you see here into the office one morning. I didn’t mention it to anyone other than to put the container on the table in the kitchen, and leave a handwritten note on a napkin with the following: “Homemade almond flour vanilla baked donuts – they’re gluten-free (don’t let that deter you) – Katie.” I didn’t even mention the champagne, lest people accuse me of getting them drunk at the office. There’s only a hint in the glaze anyway. 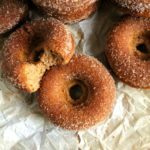 Within an hour, I had 4 people separately show up at my desk demanding to know how I’d managed to BAKE such delectable donuts, how on earth they could possibly be gluten-free, and where to find the recipe. Brian had already let me know, after trying one the day before, that he wasn’t pleased with my decision to take these donuts to work. I knew then that we had a winner. Last week, I posted the recipe on Instagram (if you aren’t following yet, what are you waiting for?!) and caused a bit of a ruckus. 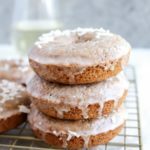 I received more than a few messages wondering why it wasn’t on my site, and a few more indicating that these little champagne baked donuts were going to be featured in their kitchen that very weekend. If you are one of those people, you don’t know how happy and grateful this makes me. I cannot express how gratifying it is to see others enjoy the work that I do and share it – and how wonderful it is that this doesn’t feel like work at all. 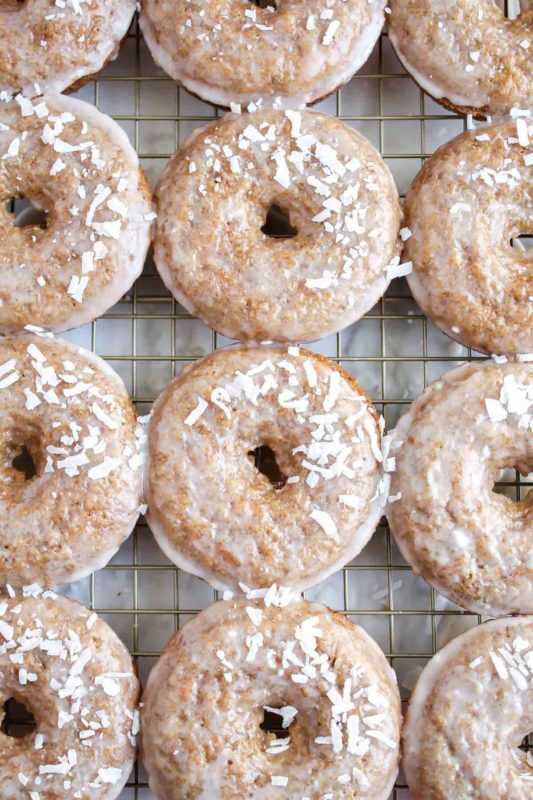 These donuts are made with Simple Mills Vanilla Cake Mix, an almond and coconut flour cake mix from a Chicago-based company that I adore (I used the same mix to create the crust for this raspberry coconut tart). The flavor is perfectly vanilla almond, subtly sweet, and ideal for glazing with champagne. I think they would be perfect for a bridal shower, bachelorette party, or a weekend brunch. Or, you know, a Monday. So, here’s the recipe again, for all of us to refer back to when we need a little sparkle. I hope you love it as much as I do! 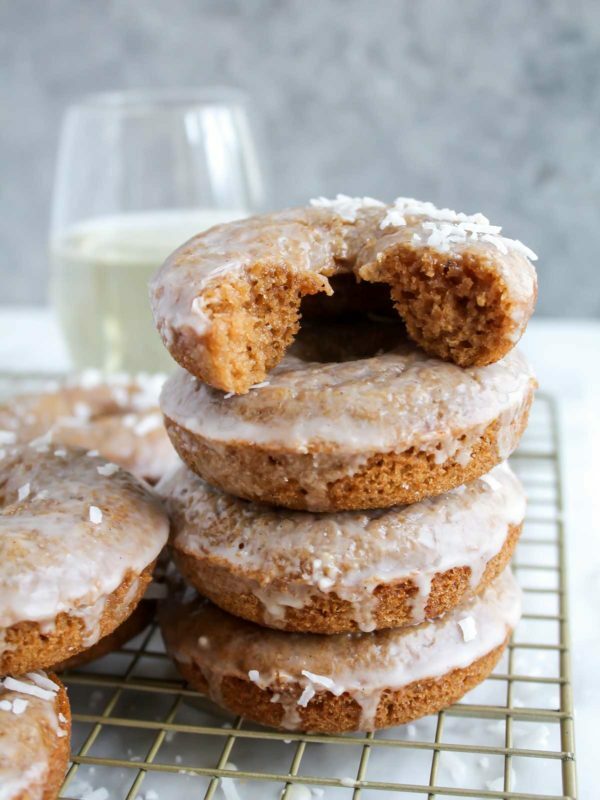 Vanilla-scented almond flour cake donuts coated with a champagne-vanilla glaze. Preheat oven to 350 degrees F. Grease 2 standard donut pans and set aside. In a large bowl, whisk eggs together. Whisk in oil, almond milk, and vanilla extract until fully combined. Stir in Simple Mills Vanilla Cake Mix until mixture is smooth and fully combined. 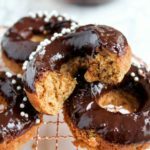 Pour batter into a liquid measuring cup with a spout, and pour batter out evenly among the wells in the donut pans (you can also do this with a spoon, but I find it easiest to use the measuring cup). Bake for 10-12 minutes, until risen and golden brown at edges. Let cool for a few minutes in the pan, then remove to a wire cooling rack to cool completely. Note you may have to run a thin spatula along the edges of each donut before removing from the pan. 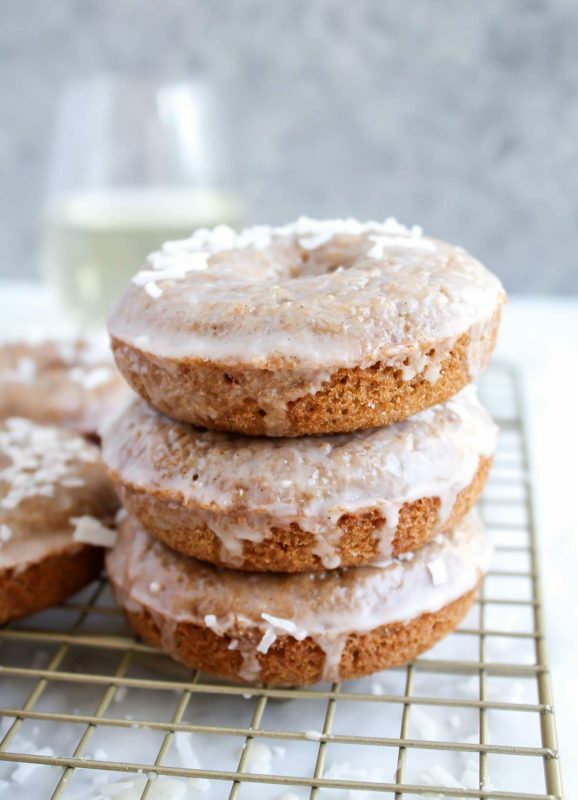 While the donuts are baking, whisk together powdered sugar, champagne, and vanilla bean paste or extract. Start with 3 tablespoons of champagne, and add another if you want it more liquidy. It should be thick though so it adheres to the donuts! Dip one side of each cooled donut in the glaze (I like to dip the smooth side that was facing up when baking), then place back on a wire rack set over wax paper. 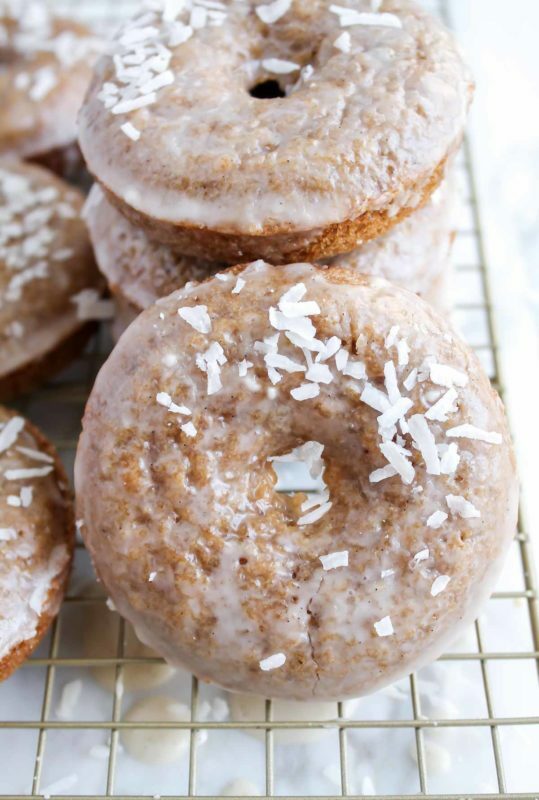 Top with sprinkles or shredded coconut and enjoy with a mimosa! You can find Simple Mills cake mixes on Amazon, at Whole Foods, or on the Simple Mills website! 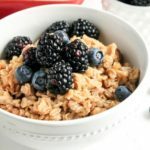 Thank you to Simple Mills for providing the ingredients for this recipe. Yep, that bite was mine. That champagne behind it was too. Thanks so much Jenny! Hope you enjoy.